Sean Lilly Wilson is the owner of Fullsteam Brewery in Durham, North Carolina and a person I’ve wanted to meet for a long time. 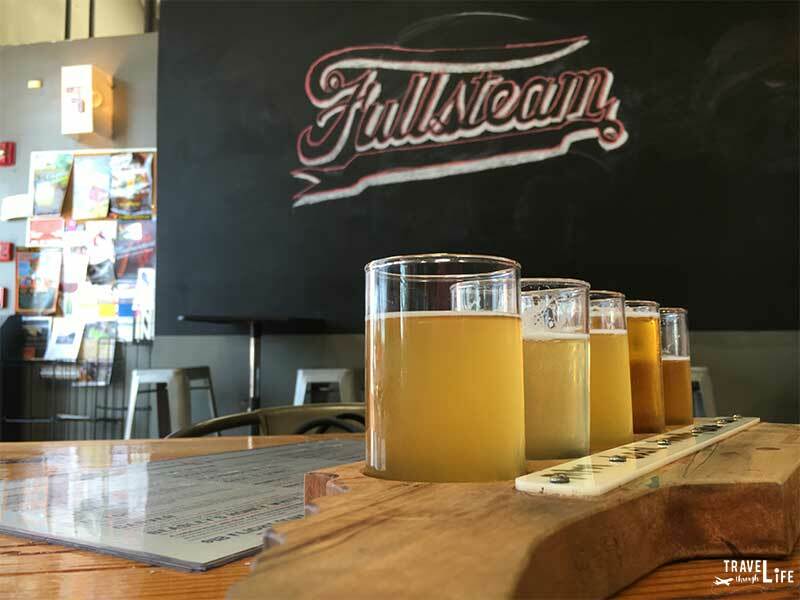 Fullsteam was one of the first places we visited in the Bull City and remains at the top of our “where to eat and drink in Durham” list. 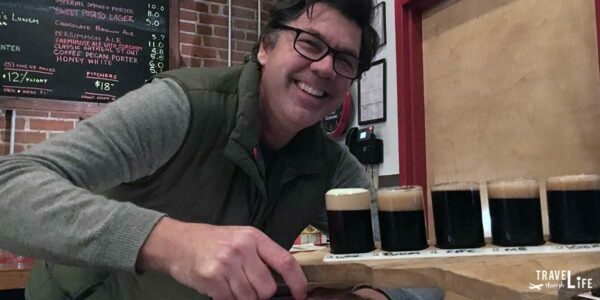 During my first-ever moments sitting in his Tavern, I had no idea about Sean’s part in bringing craft beer to North Carolina, his journey to becoming an entrepreneur, or his battle against kidney disease. Thanks to Sean graciously offering a few minutes of his time for an interview, that’s what I’m going to share with you here. Fullsteam Brewery also featured in our guide to casual restaurants in Durham! See what else appeared after you learn more about Sean Lilly Wilson! This interview with Sean Lilly Wilson is part of our blog’s series on People Who Travel and originally appeared on our sister site NC Tripping. Carl Hedinger: Are you originally from Durham and if not, what brought you here and what is keeping you here? Sean Lilly Wilson: I’m not originally from Durham. I’m not really from any place. If I had to say that I was from any place, I would say probably Pennsylvania. I was in suburban Philadelphia from 5th grade to 12th grade. Before that, I bounced around a lot between New Jersey, Massachusetts, and Springfield, Missouri. My wife and I met in college in Illinois. We met when she was just about to graduate, so we moved here to Durham when she came to the Duke Divinity School in 1992. Even though my wife and I are both Duke alumni, something that we wanted to do with Fullsteam was to make it about Durham. Not everyone in Durham is a Duke fan or even cares about the Duke game. We kind of have a broad mentality. CH: What made you want to start a brewery in North Carolina? SLW: I didn’t start out wanting to start a brewery. My love for craft beer really kicked up when I was in grad school and a classmate of mine was a home brewer. He had a huge passion for beer and wanted me to come try his beer. At one point he told me that I need to come to this event that was on campus. He said there’d be beer there that I’d never tried before. I was like “yeah, sure whatever.” I thought I knew good beer because I bought whatever was on sale at Harris Teeter. The event was hosted by the Southeastern Microbrewery Association, who had an after party at the old Armadillo Grill. They showcased beers that I really had never seen before. I asked my friend where I could get these beers but he said, “You can’t. They’re illegal in North Carolina.” I thought that was crazy and that’s what led me to spearhead Pop the Cap, with a bunch of other people.” That was the impetus for craft beer in North Carolina. I worked as a volunteer for three years trying to change the law and that’s where I learned that I loved the industry. That’s when I also decided to be my own boss. We launched Fullsteam five years to the day [in 2010] of the lifting of the cap. North Carolina Craft Beer & Breweries discusses Pop the Cap, Fullsteam, and many more breweries that you’ll find when traveling through North Carolina. CH: Are there any other people from Pop the Cap that are still around and prominent? SLW: Yes and no. Daniel Bradford was the head of All About Beer magazine for many years and the World Beer Festival. He’s basically retired now from all of that. 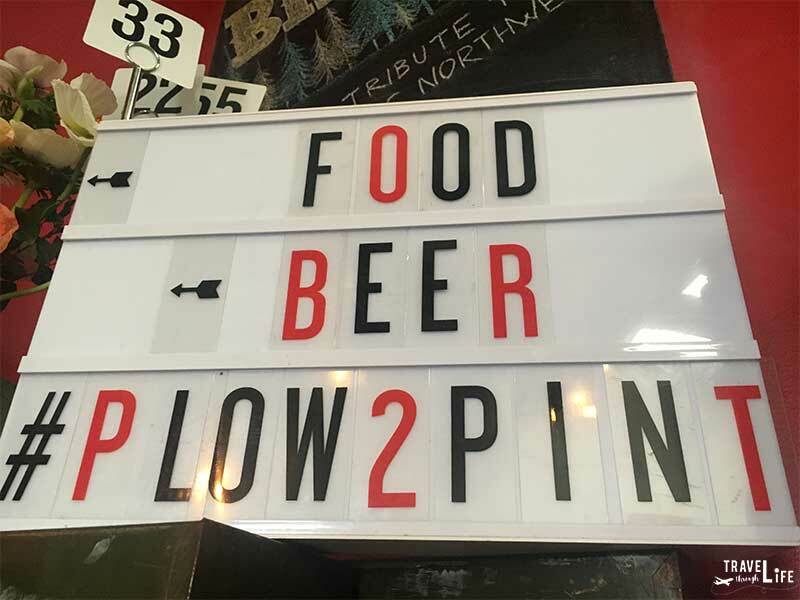 Julie Johnson still writes about craft beer in the area. On the business side of things, many people are still in the industry. Pop the Cap was largely a volunteer and consumer-driven movement. Most of the people who had any involvement with Pop the Cap are still going on and living their lives drinking craft beer. As for me, when I was working on my MBA in Public Policy, one of my mentors said that I was “an entrepreneur in waiting.” Shortly after that and after Pop the Cap, I was diagnosed with kidney disease and really on the decline. I needed a transplant, so my wife gave me a kidney. It was at that time that I said that I’m ready to go full steam ahead. CH: Have you ever shared a beer with any celebrities here at Fullsteam? SLW: We like to call Fullsteam Durham’s unofficial welcome center. But, you know, no. Everyone’s a celebrity when they come to Fullsteam. What brings me joy isn’t any notoriety that I have or notoriety of the people who come, but instead from the people who come here and bring their kid for the first public outings, or birthdays. To watch a group in the corner sing “Happy Birthday” is what gives me joy. Sidenote: Christina and I actually held our wedding’s after party at Fullsteam. CH: Any future plans for Fullsteam? SLW: We are at capacity now. We did increase production by 40 percent and so our barrelage is basically maxed out at about 8,000 barrels. So, we won’t be able to grow much more at this site. You might look around and think there’s a lot of space, but there really isn’t. As this neighborhood changes, we want to make more use of the dynamic neighborhood component. Where we’re sitting right now is used as a storage space, but we’re hoping to transform this space into a kitchen and additional seating. We could turn it into a private party room, like a modular room. We do fun little pop-ups in here occasionally when the weather is nice. This will be built out within a year with a full kitchen. Then, we also need to increase production and go somewhere. Reduce our footprint here on the brewing side and scale up. 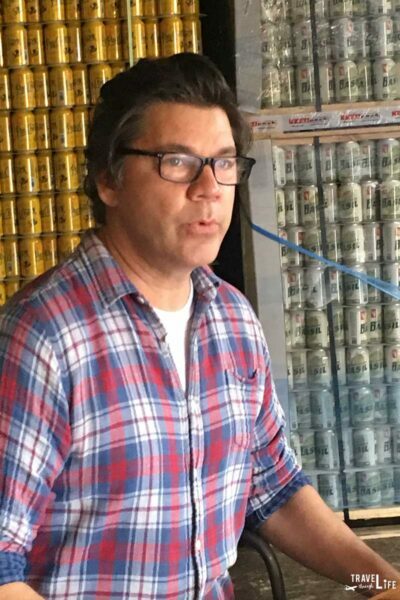 CH: Any advice for anyone who wants to start a craft brewery? SLW: Know your niche. Know your customer. Be incredibly patient. Stay positive as much as your able to. Get into it for the right reasons. Know that it’s not a path to riches, but it’s immensely satisfying. Know what you stand for. Don’t forget that the most vocal people are important but a small minority and that you can get distracted or bummed out by the people who forget that beer is a beverage of celebration. You want to make sure that you’re not ignoring them, but you don’t forget to let the feeling you get from watching people celebrate guide you. Also honing onto your values, and why you exist. Why do you do what you do? And how do you get your people to make it happen? Just as I was wrapping things up with Sean, he wanted to share a little bit more about himself and how he views what he’s doing at Fullsteam. SLW: Art happens on the fringes and on the outside. I’ve never been a person who wanted to be a part of the cool kid’s clubs. I don’t thrive in those environments because art and change happen on the periphery. I don’t want to be cool. I’ve thought about whether or not I wanted to make the news and report the news. But as you grow and mature, you realize that it’s less about you. It’s about Fullsteam. It’s about the farmer and the agricultural entrepreneurs. I want them to make the news. As more Durham breweries pop up and competition grows fiercer, I still ask people about the beer here and they normally say Fullsteam first. It’s even cool to see that signature backward “F” on taps whenever we’re traveling throughout North Carolina and beyond. I’m really happy to have met the man behind it all. He’s really a kind person and years ahead of the game. It’s also great to know that he loves what he’s doing and that it’s not about him at the end of the day. I truly look forward to watching Sean Lilly Wilson and his team continue to push new boundaries, create delicious beer and food, and going, as he said, Fullsteam ahead!